Host of MSNBC’s Hardball Chris Matthews opens up this year’s Mason Communication Forum. Photo By (Kaitlyn Koegler/Office of Student Media). 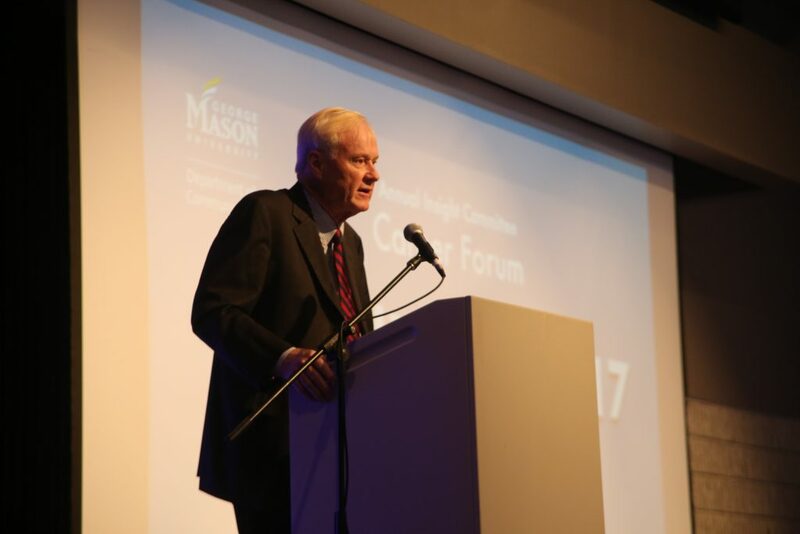 On Tuesday, October 24, host of MSNBC’s Hardball Chris Matthews opened this year’s Mason Communication Forum with a conversation addressing “fake news” and journalism today. The conference, named #RealNews2017, was an interactive event that enabled students to exchange insight about today’s “social-mediated world”, first illustrated by Matthews. Though “fake news” has become a hot topic circulating throughout social media platforms, news outlets, and even in 3 a.m. tweets, it is not a new concept. It has always been here. Today, consumer-run, unedited content initiatives contribute to the disparity among opinions and a misinformed populous. Driving unfiltered ideas and revealing raw content is an unprofessional yet tempting move, all of which can lead to deviance away from the truth. And that is what makes up the role of a journalist today. They strive to repair consensus, expose the absolutes, and inform the public with honesty and clarity. According to Matthews, there are three rules to journalism. One, is to peer-review and edit. “This is what separates journalists from B.S.”, Matthews said. Second, is to embrace diversity. Viewpoints are no longer linear, and tending to multiple audiences should be made a priority by professionals entering the journalistic field. Last, is “to have to want to make it.” Quality writers attain a passion driven by the truth. Following Matthews’ keynote address was a panel discussion and speed table sessions from distinguished media professionals. His introduction set a foundation that continued the on-going conversation of what journalism is now. Modern coverage means unveiling the truth, checking the facts, remaining honest, and tuning out outside forces which populate the inter-web today.